It's a brand New Year, and we want to welcome it in with a healthy dose of wealth creation. No better way to do that than with our wonderful line of Money Drawing Products. 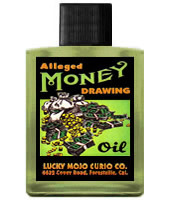 Our random drawing will help 7 of our Facebook Friends acquire America's finest Money Drawing products. Today's top winner will receive a Lucky Mojo Money Drawing Mojo Bag. 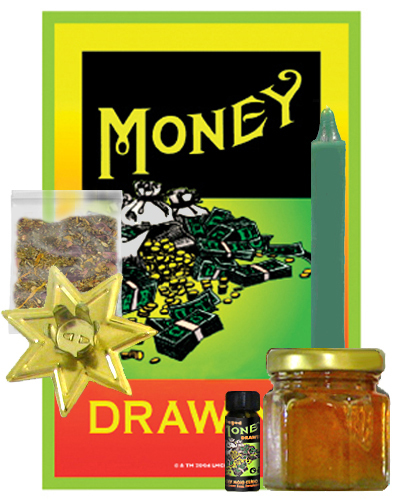 Second prize is a complete Money Drawing Honey Jar Spell Kit. A fixed and blessed Money Drawing Vigil candle is next, followed by a bottle of Money Drawing Oil. A packet of Money Drawing Sachet Powder goes to another winner and a packet of Money Drawing Bath Crystals to yet another. And, finally, a packet of Money Drawing Incense Powder goes to the last of our 7 lucky winners. All you have to do to enter is to go to the Lucky Mojo Facebook page, scroll down, and post a comment to the Facebook Fridays! status message for January 3, 2014. At the end of the day, we will select seven winners at random, announce their names here, contact them via Facebook to get their mailing addresses, and send them their FREE BRAND products. Wow! Thanks for posting this Ernie! Looks great. Folks, click that link and enter the contest! We have a winner! In fact, we have seven lucky winners! And, it should be mentioned that this drawing had a record number, 339, of contestants! Seems everyone is enamored of this new weekly feature. Our Facebook Fridays Giveaway winners for January, 3, 2014 are: Sarah Rosalena Brady, Elizabeth Marie Tanous-Gallner, Christopher Lung, Lisa Ann Simcina, Charlene Mudd, Miggy Mike and Jim d'Aina.